Does thought depend on language? Primarily as a consequence of the cognitive turn in empirical disciplines like psychology and ethology, many current empirical researchers and empirically minded philosophers tend to answer this question in the negative. This book rejects this mainstream view and develops a philosophical argument in favor of a universal dependence of language on thought. In doing so, it comprises insights of two primary representatives of 20th century and contemporary philosophy, namely Donald Davidson and Robert Brandom. 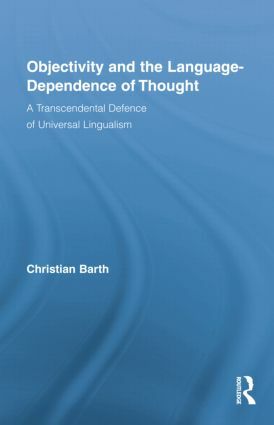 Barth offers an introduction to the debate concerning the language-dependence of thought and lays the methodological foundation for the subsequent argument in favor of a universal dependence of thought on language, presenting an account and defense of the transcendental method in reference to the writings of Peter F. Strawson. He then offers a transcendental argument in favor of a universal language-dependence of thought, beginning with a reevaluation of a basic idea for an argument originally presented by Donald Davidson. Later, two main objections to the conclusion of this transcendental argument are addressed and rejected using Robert Brandom’s inferentialist and normativist account of thought and language. In the course of doing so, the recent debate on Brandom’s work is addressed extensively, and main objections to Brandom’s work are presented and answered. Christian Barth is a postdoctoral research fellow in philosophy at Humboldt University, Berlin.